Funny how a single agreed upon date on the calendar can collectively move millions of people to decide to be, do and feel better. What is so magical about January 1 energy? At the beginning of every new year, people traditionally have looked themselves in the mirror and taken stock of their lives. And then resolve to create their best life this new year. A flurry of vision boarding, affirmation statements, exercising, self-help book reading, detoxing, meditating, and dieting begins. This is the year I will try harder and stick with it no matter what! And then slowly, as the excitement and brightness of the start of the new year fades into the everyday reality of living life, our resuscitated resolutions start to fade as well. Forgot to pick up veggies to juice. Such a hard day at work cannot think about exercising. Oops, ate that bagel/chocolate bar/muffin/pizza slice. Lost it with the kids. Forgot to sit and meditate again. Cannot ever seem to remember to take those vitamins. I earned that glass of wine today. Life can be busy, stressful and rushed. So often we feel pulled in ten different directions at once. And dumped on. A slip up or two seems to erase all of those good intentions we had going just a few weeks ago. And when we slip up, we tell ourselves it’s just too hard. I’m not strong enough. I don’t care anyhow. Well, I tried. I just can’t seem to. I don’t have the time. And we fall back into our old, comfortable, self-sabotaging habits. Decided: this year will be different for me. Daily commitment. Hourly commitment. Commitment in this very moment. Going steady with commitment means that I truly, deeply, soulfully want this for myself. And it allows me to be human. I know what my heart wants to accomplish this year. I’ve vision boarded it. I’ve written my goals and deadlines down on paper. I’ve told people about it – spoken it out loud. Now I get to choose to commit to it. And I am committed to it No Matter What! My commitment to manifesting my desires is so strong that when I slip up it’s okay. I recommit in the very next breath and Go On! Some days are so smooth that I stand strong and I do all the necessary things to support what I’ve committed to and I glide toward my goals Other days are messier and I may waver a couple of times when I needed to make wiser choices and then I stumble toward my goals. But it’s all good because I keep moving forward and toward! May all of your goals be reached one day, one hour, one moment at a time. In Chinese culture, noodles represent longevity since they are usually served in long strands. Cabbage represents prosperity and luck. Soba (buckwheat) noodles are traditionally eaten on New Years Eve in Japan. Wishing you a long, prosperous and healthy life! Happy New Year! Cook noodles until al dente or according to package directions. 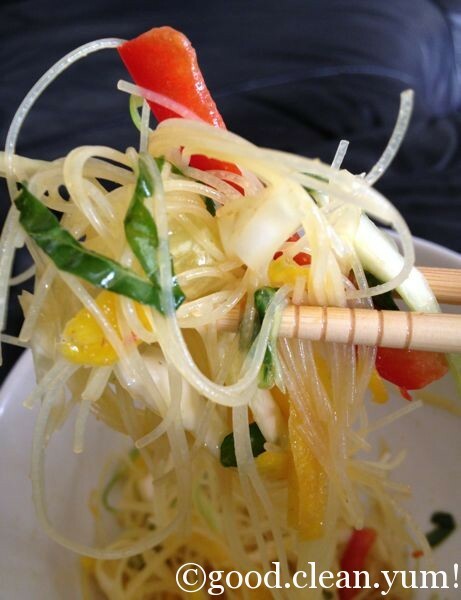 If using rice stick noodles, they just need to be soaked in warm water. Rinse noodles with cold water and drain. Set aside in a large bowl. 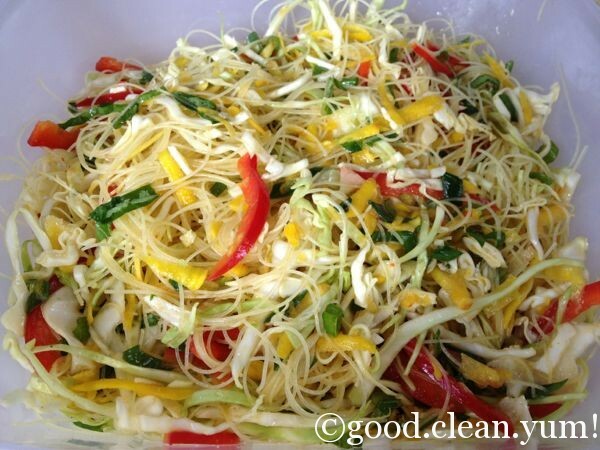 Add the prepared cabbage, basil leaves, beets, red pepper and scallions to the noodles and toss to combine. 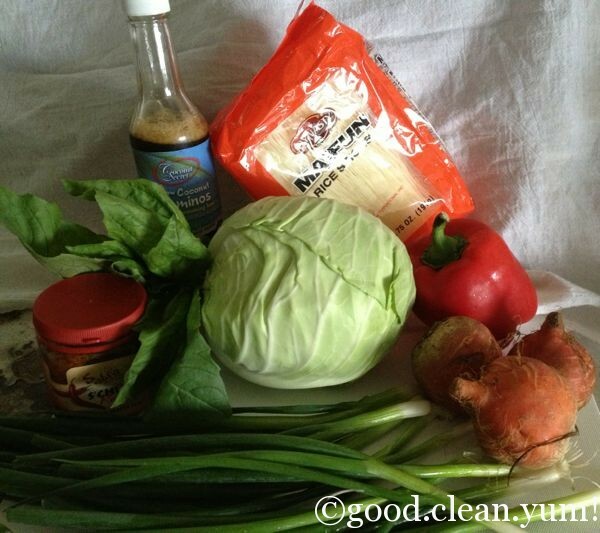 Make the dressing by combining all of the dressing ingredients into a mixing bowl, whisking well to incorporate. 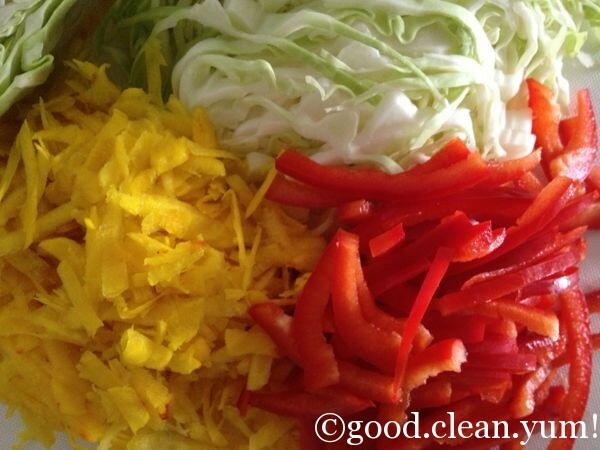 Pour the dressing over the noodle-vegetable mixture. Toss well to ensure dressing is thoroughly integrated. Taste and season with salt if desired. Transfer to a lovely serving bowl. Sprinkle with the toasted sesame seeds and the additional shredded basil. Makes 6 – 8 slippery, satisfying, delightfully spiced, crunchy servings! I’ve always been accused of being too serious; too “deep” by people my entire life. Somehow, I came into this world with a great soul-weight and gravitas. Adults would look at the little girl me and say things like, “She would be so pretty if only she would smile!” I remember wondering why I couldn’t seem to laugh and do stupid things like so many of my friends enjoyed doing while we were growing up. As an adult and a mom, I still tend to be solemn. There is so much sadness in the world, so many people to help, so many things I still want to accomplish. Thankfully – isn’t the Universe perfect? – I became a preschool teacher. The messiest, silliest, sparkles-always-stuck-to-her-skin kind of teacher. And when I do laugh, it’s the laugh that has tears running down my cheeks! I’ve made my peace with my earnestness. And I’ve found ways to balance it out. For me, that’s good enough. 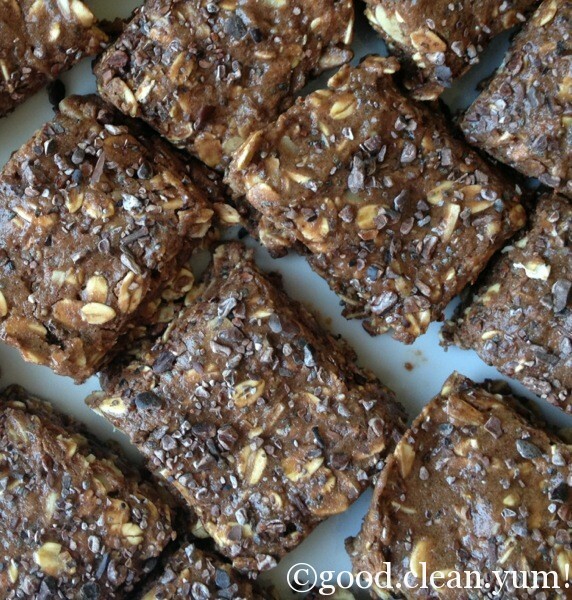 These bars are deeply chocolate-y and have a satisfying chew to them. Although the cocoa nibs are not sweet, somehow they almost taste like chocolate chips when they are mixed into the rest of the ingredients. 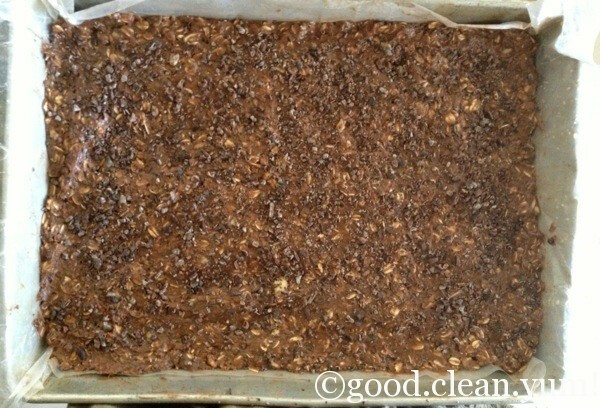 These bars are packed with vegan protein and fiber. The cocoa nibs are high in magnesium, iron, chromium and antioxidants. Chia seeds are a great source of Omega 3’s, fiber, antioxidants and minerals. Mix all of the ingredients – except the cocoa nibs – into a large mixing bowl in the order given. Add in ¼ cup cocoa nibs. Stir. Add more water as needed so the mixture is still thick, but not too dry and/or crumbly. Spoon this into a 13-inch by 9-inch baking pan. With slightly wet hands, flatten mixture into the pan evenly. 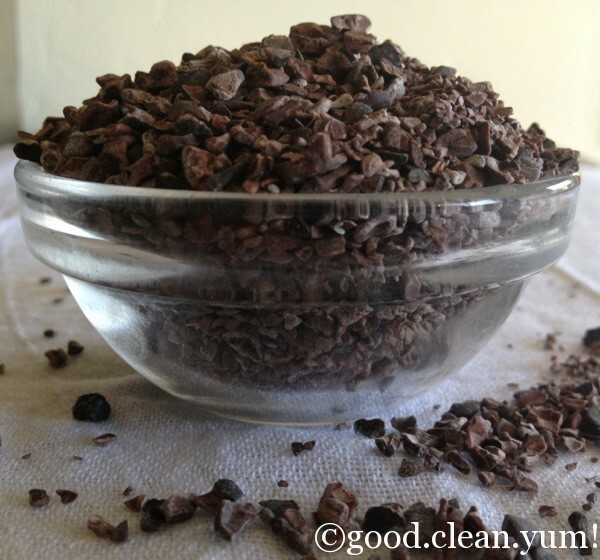 Sprinkle the remaining cocoa nibs over the top and refrigerate for at least 2 hours. 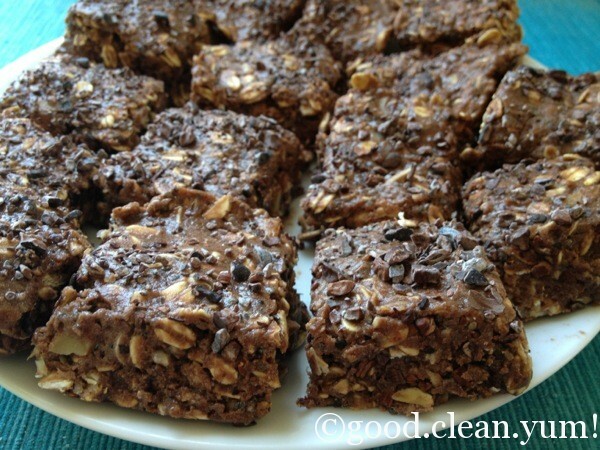 Cut into bars of any size that suits you! Will keep in the fridge for a couple of weeks. For longer storage, wrap each bar in plastic wrap and place in a freezer bag. Freeze for up to 2 months. Makes: about 45 bars, depending on the size you choose to cut them into! *We do not share your e-mail with any third party. 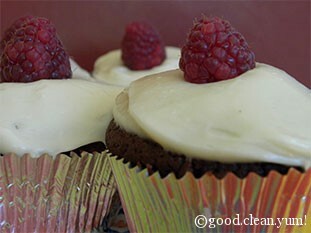 Copyright © 2012 - good.clean.yum!/Tamara Leider, unless otherwise stated. No information, ingredient or product mentioned on this site is intended to diagnose, treat or replace professional medical advice. They are my personal reflections and experiences. Please consult with your doctor before using any ingredients or products mentioned here.